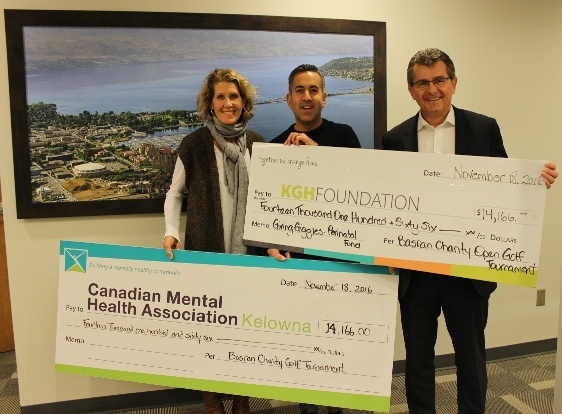 Kelowna Mayor Colin Basran splits proceeds of the 7th (and final) Basran Charity Open with KGH Foundation and CMHA-Kelowna. It was another great day for the 7th Annual Basran Charity as golfers and friends took to the links to raise over $28,000 in support of advancing the health care in our community. The proceeds from this year’s event brings the total funds raised over the past 7 years to over $97,000. Basran initially began hosting the tournament in honor of his grandmother, who has ALS. However, since the second year, the proceeds have gone to support local causes where the money raised will have a direct impact in the community.